Point Pleasant senior Sam Pinkerton belts an RBI single during the second inning of Friday night’s non-conference baseball game against Wahama in Point Pleasant, W.Va.
Wahama freshman Ethyn Barnitz (10) crosses home plate during the third inning of Friday night’s non-conference baseball game against Point Pleasant in Point Pleasant, W.Va.
POINT PLEASANT, W.Va. — The third inning was big … both ways around. 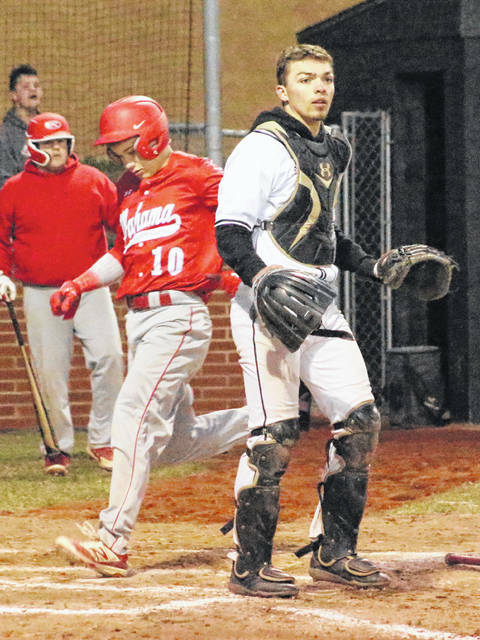 Both teams combined for 10 runs and a pair of lead changes during an explosive third frame, but host Point Pleasant ultimately won the battle to remain unbeaten Friday night with a 9-4 decision over visiting Wahama in a non-conference matchup of Mason County programs. 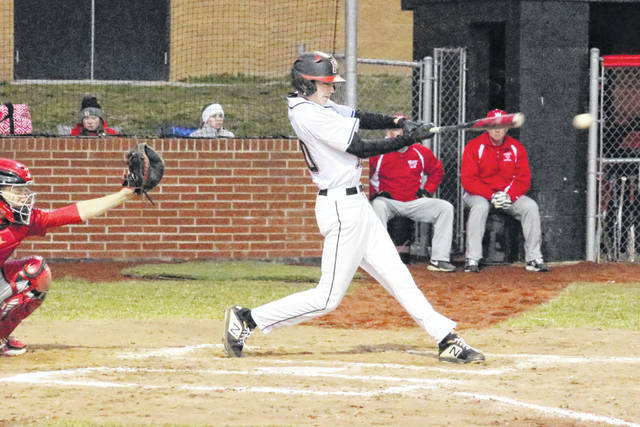 The host Big Blacks (4-0) built a 1-0 lead in the bottom of a second as Joel Beattie scored on a two-out RBI-single by Sam Pinkerton, but the White Falcons (2-1) countered with their only offensively outburst of the evening. Ethyn Barnitz produced a one-out single to start the third, then advanced to second on a walk to David Hendrick. Jonathan Frye followed by laying down a supposed sacrifice bunt that instead turned into an error, putting runners at the corners after Barnitz scored for a one-all contest. Frye ended up stealing second on the first pitch to Tyler Bumgarner, then Bumgarner lifted his first career over-the-fence home run to left-center. The three-run blast gave the Red and White their only lead of the night at 4-1. The Big Blacks also found some offensive rhythm in their half of the third as 10 batters came to the plate, resulting in six runs on five walks, a hit, a fielder’s choice and a hit batter. Carter Smith started the rally bid by being plunked to lead things off, then Miles Williams drew a walk before Brody Jeffers launched a rocket on a straight line to the left fielder for the first out of the inning. Beattie and Kyelar Morrow both drew free passes to force home Smith for a 4-2 deficit, then Tanner Mitchell singled to left while driving in both Williams and Beattie for a four-all contest. Pinkerton followed with a walk to reload the bases, but Josh Wamsley grounded into a fielder’s choice that resulted in Morrow being forced out at home. 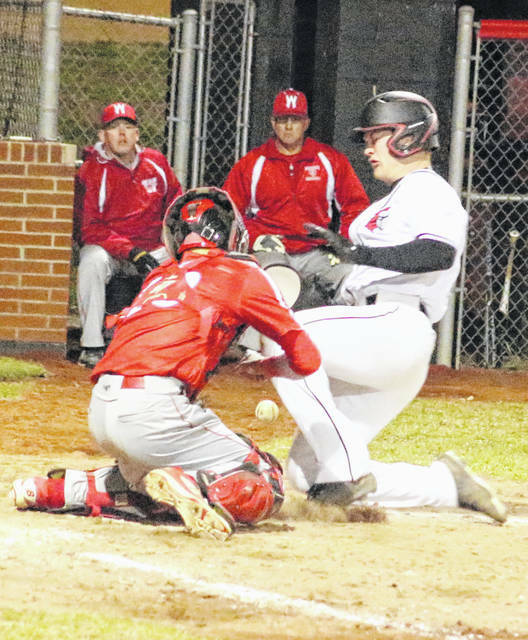 Mitchell ended up scoring the eventual game-winning run on a passed ball, then a wild pitch ultimately allowed both Pinkerton and Wamsley to score while extending the lead out to 7-4 through three complete. The White Falcons mustered just four hits and six baserunners the rest of the way, with half of those baserunners getting as far as second base. The Red and Black, on the other hand, continued churning out insurance runs the rest of the night — starting in the bottom half of the fourth. Williams led things off by being hit by a pitch, then stole second and advanced to third on a groundout by Jeffers. Williams came in to score after a Beattie sacrifice fly to center, giving the hosts an 8-4 edge. 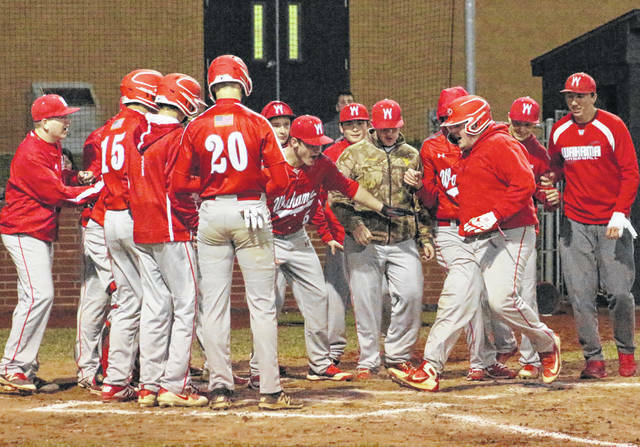 PPHS added another run in the sixth after a Beattie double allowed Hunter Blain to score from second, wrapping up the five-run outcome. The Red and White outhit the hosts by a 9-6 overall margin and also committed only one of the three errors in the contest. Point Pleasant, however, drew three extra walks (5-2) and benefited from all three hit batsmen. The Big Blacks ended up leaving only six runners on base, while the guests stranded nine on the bags. Both teams also used a trio of pitchers apiece over the course of the night. Joe Herdman was the winning pitcher of record after allowing zero runs, three hits and one walk over three innings of relief while fanning six. David Hendrick took the loss after surrendering seven runs (six earned), four hits and four walks over 2⅓ frames while striking out one. Beattie paced the Big Blacks with two hits and two RBIs, while Tanner Mitchell also drove in two runs with a hit. Blain, Jeffers and Pinkerton also had a safety apiece for the victors. Pinkerton and Morrow each drove in a run as well. Williams and Beattie added a team-high two runs scored apiece. Tyler Bumgarner and Brady Bumgarner led WHS with two hits apiece, with Tyler accounting for all three of the team’s RBIs. Hendrick, Barnitz, Antonio Serevicz, Tanner Smith and Trevor Hunt also had a safety each in the setback. Point Pleasant was at Wayne Saturday and returns to action Wednesday when it hosts Buffalo at 6 p.m.
Wahama opens league play on Monday when it travels to Waterford for a 5 p.m. contest.